Mouser Electronics, Inc., the industry’s leading New Product Introduction (NPI) distributor with the widest selection of semiconductors and electronic components, is now stocking the CYW20719 dual-mode Bluetooth wireless microcontroller from Cypress Semiconductor. Optimized for Internet of Things (IoT) applications, the CYW20719 is an ultra-low-power microcontroller device that complies with Bluetooth core specification version 5.0 (with LE 2 Mbps optional feature) with support for mesh networking. Forged using an advanced 40nm CMOS low-power fabrication process, this system-on-chip (SoC) employs a high level of performance and integration to help reduce external components while minimizing the footprint and overall cost of the application. 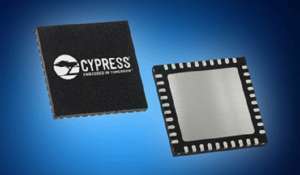 The microcontroller subsystem of the Cypress CYW20719, available from Mouser Electronics, consists of a 96-MHz Arm Cortex-M4 microcontroller with floating point unit (FPU), 512 KBytes of RAM, 2 MBytes of ROM (containing the stack and drivers), and 1 MByte of probe-proof flash memory. The probe-proof flash, once programmed, not only prevents hackers from reprogramming the device to gain access to sensitive user data or payment information, but also inhibits competitors from doing a flash dump to reverse engineer the firmware IP. For additional security, the CYW20719 includes various security functions — such as ECDH, RSA, AES and SHA/MD5 hashing functions — as well as a hardware accelerator to ensure best-in-class encryption for Bluetooth. The ultra-low-power radio in CYW20719 delivers a Bluetooth low energy (BLE) receive current (Rx) of 5.9 mA with sensitivity of -95.5 dBm and a transmit current (Tx) of 5.6 mA at 0 dBm. Ultra-low current consumption in this device enables extended battery life for a variety of wireless IoT devices, including wearables and fitness bands, home automation, medical devices, and proximity sensors. The CYW20719 is supported by the CYW920719Q40EVB-01 evaluation kit and the Cypress Wireless Internet Connectivity for Embedded Devices (WICED) Studio IoT development platform, which provides all the application programming interfaces, code snippets, and demo applications to accelerate the development process.